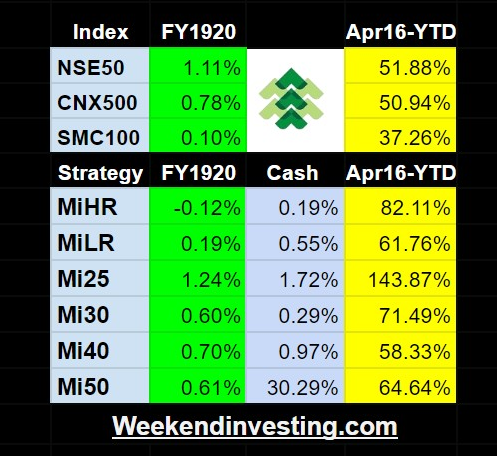 Mi40 is a slow moving conservative Momentum Type B strategy that thrives on longer term trends forming in the constituent stocks of CNX500. The allocation will remain 2.5% of the portfolio in each stock. The base logic is a combination of that seen in Mi50 and Mi25 , albeit on a larger time frame and a defined set of universe of stocks, viz CNX500. With the higher liquidity usual in this category, impact cost and slippage is minimized. The average churn in this portfolio will be close to average 30 trades per year. It seeks to capitalize on larger medium to long term trends in the constituents. This strategy is expected to generate on average 15-20%+ CAGR with panic deep draw-downs up-to even 40%. In a simulation of last 14 years, most draw-downs were limited to around 20% but in 2008 this was 38%. In the simulation, the CAGR achieved was much above the expected 15-20% (Taxes, fees and survivor-ship bias not accounted for) As with other strategies, if opportunity is not available, money will go sit in LIQUIDBEES. I am deliberately not putting up simulation results to avoid any bias for past performance. UPDATE: Mi40 post the Union Budget 2018 was converted to a weekly strategy from monthly as the sole purpose of gains under the zero LTCG regime was lost. please add me to your Mi40 and Mi50 subscriotion list. I can see the method of subscribing to Mi25 portfolio. But want to follow Mi40 & Mi50 strategy as well. Kindly add me to the list. I also want to know how it exactly works as it I mentioned on your website that there will be profit sharing for this strategy. Please send me mail for details on the other strategies and profit share. I am fortunate to read the article about you in Moneycontrol.com; Congratulations and Best wishes to you to continue, disseminating the great knowledge and experiences, you acquired over two decades, to the less fortunate Indian common man !! Do you know any similar programs/portfolio advisary services in US/Canada ? or do you have any plans to extend your services for NASDAQ/DOW for NRI’s ? Thanks for your kind words. So far we have our hands full with the India mkt.